The sun has got its hat on again – and a good job too, as whisky fans queued through the night in the hope of nabbing a coveted bottle of Bowmore’s Fèis Ìle whiskies. Following hillside walks and talks, music and multiple drams, Dave Broom reports on his final day at this year’s Islay festival. It seemed appropriate, I realised, that the previous evening’s activity had been an excavation of some of Islay’s past, courtesy of Hunter Laing’s Kinship tasting, where Jim McEwan took a packed hall through half-a-dozen aged Islay malts. The talk was as much about people and memories as it was about the whiskies themselves – profound though they were – spanning Sherry to salt, generous to austere, fruit to smoke, contemplative to mental – a snapshot of Islay’s complexities. He mixed stories with poetry, laughter with passionate insistence that we should remember heroes such as the late, and much missed, John MacLellan. At the end of every pair Robin Laing sang a couple of songs, weaving magic with his words and music. His musical narratives add an emotional heft to whisky, show how it touches on every part of life, from the absurd to the romantic. Over a three-hour ramble with him and Lagavulin’s Georgie Crawford, we move along track and grasslands, over river and up steep banks, listening to tales which themselves summon up different epochs: from the Mesolithic to the Bronze Age, to Celtic saints and the Lords of the Isles. The identifying marks of each are subtle – told in place names as much as ruins – as the common tongue shifted from Gaelic to Norse, and back again. There are echoes in religion as well. As we drink a fresh and restorative Lagavulin 8-year-old by Kilbride Chapel, Georgie tells us of how the wing beats of oystercatchers sped St Bridget to Islay, and how in turn she was actually a Celtic goddess borrowed by the Celtic church as it spread across the west. The fact that she was the goddess of fire seems somehow appropriate on the Kildalton coast. A new Islay began to reveal itself: a place of flint knappers, peat cutters, Neolithic farmers, bards and warlords. We haul ourselves up the bank beside the waterfall that cascades from Laphroaig’s water source, past the witches’ stones to Lagavulin. The stories give a new perspective on what is too easily dismissed as ‘whisky island’. Sunblock was the order of the day by the time I reached Bowmore. The queue for the Fèis bottles had long gone (as had the bottles) and those who had started waiting at 5.15am were (hopefully) fast asleep in their beds. The distillery courtyard was still full. In one corner old warehouseman Ginger Willie was recounting tales of the old days, while monitoring an impromptu game of fling the bung. A couple of days previously, he, Eddie MacAffer and other retirees had held an afternoon tea (though little tea was taken) in which they had reminisced about those old days. Bowmore seems to have grasped fully the importance of retaining such links. Not only are people interested in their stories, but a loss of that connection with the past irreparably damages your brand. By not forgetting its past Bowmore is moving forward with a new sense of purpose. Beam Suntory’s stated aim is to once again make the style of Bowmore made in the ’50s and ’60s: long fermentation, clear wort, slow distillation and a search for tropical fruit on the side of Loch Indaal. If some recent bottlings are anything to go by that process has already started – the mango juice lurking at the finish of the new 15-year-old made it the highlight of a series of intimate classes taken by Gordon Dundas. ‘The 10-year-old is for poker with your friends, 15-year-old is sitting on the sea wall with a wet dog beside you, and the 18-year-old is when those friends have left,’ was his neat summation. I sneaked up into the malt barns where masterclasses were set up on two floors, including one taken by brand ambassador Simon Brooking showing this year’s Fèis bottlings, perhaps for those who hadn’t set their alarm clocks early enough, which was on one hand generous and on the other evil because one of the bottlings will go down in legend (though you’ll have to wait until next week to find out which one it is). On the floor below in the midst of golden waves of malt another group was tasting through the extended range. Each layer of the building was another story, adding their messages and meanings to Islay’s tapestry. It’s a perfect ending to my trip. Next year? I can’t wait. 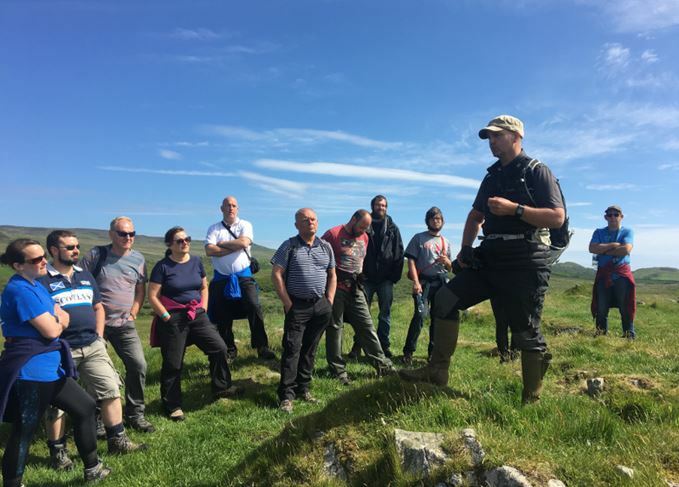 A complicated trek to Islay reiterates what the whisky festival is all about to Dave Broom.